Two things I remember about this day. The first was Kayaking towards Cumberland Falls. The second was the bear. Joe and Kate had left shortly after dinner, as Joe wanted to get back to Lexington for some pre-wedding Best Man duties. Whilst having a few drinks on the balcony and reviewing the great day we’d had, came the call from Kev. “We’ve got company” Kev shouted from the kitchen. And right we did. 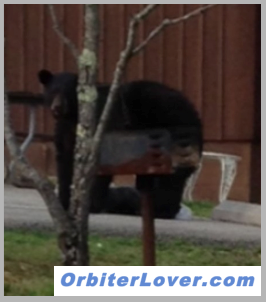 Right outside the kitchen window, a giant black bear was going through the bin. He quickly scrambled and raced across to one of the other cabins when he heard us fumbling around for our cameras. To be honest, bears are nothing but scavengers. And the state of California decided to put one on their flag. Bloody liberals. We rang Du Pont lodge, as instructed, and they sent out a Ranger to track the bear’s movements. It’s actually quite mad how wild they actually are; they’re not electronically tagged, and only manually recorded when sighted. One regular visitor said there could be as many as 11,000 bears in the region (Kentucky and surrounding states). That’s mental. That’s the equivalent of the population of Henley-on-Thames. This same visitor had never actually seen a bear in the 30 years they’d been coming here. The population is actually believed to be much lower, at around 500 black bears in Kentucky. That’s like a whole Lenwade in Norfolk populated by bears. Or a decent turn out for an early FA Cup preliminary round. We later headed into the nearest town for some dinner. On our return, driving through the darkness towards our cabin we noticed what assumedly was a stray dog lurking around in the trees. It looked scared, as if it was hiding out. We parked up and that’s when we saw the bin had been smashed to bits. The bear had ripped off the thick wooden slates, removed the metal container from inside and flattened it. Needless to say we didn’t waste any time getting in. Nothing was going to beat that. So we watched a documentary about the life of Pat Tillman, a former NFL footballer who retired to enlist in the US army following the 9/11 attacks. He was killed in friendly fire. The programme sought to reunite the man who may’ve been responsible with one of Tillman’s fellow soldiers. If you don’t particular appreciate the wit of Bill Hicks you may still be aware of his stance on advertising and marketing. Essentially, if you work in advertising, kill yourself. That’s literally it. Like too many things, his style of comedy is applied to our stages via your ‘alternative comedians’ and others who grew up with Hicks as an inspiration. But having sat through my 8th or 9th TV commercial break in one sitting, I can kind of empathize. If they’re not manipulative (Quick Buck Solutions Ltd) they’re undignified (Place4Mum.com). We all awoke at different stages of the night by the apparent movement lurking outside our bedrooms. If the bear could smash that bin, there was no reason he couldn’t break the wooden bannister and kick through the glass sliding door of our rooms. We knew he wasn’t too happy with us.